In our complex society, people of all ages are caught up in the daily struggles of their lives and rarely disconnect their minds from the barrage of noise from violence and chaos amidst a peaceful world in which they desire to live. “There comes a moment in time when a mind must get back to basics and one must reflect inside the silence of his or her ‘classroom of self-discovery,’” costume designer and author Angi Perretti says. 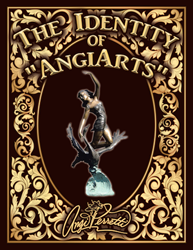 In her recently revised book, “The Identity of AngiArts,” Perretti introduces a fantastical, comic book-style cartoon character for the arts, featuring a time-traveling art zealot with super powers from the art gods who delivers joy and goodwill to all peoples during the 3rd Millennium. Through her book, Perretti hopes to rally the arts and inspire readers to explore their own creative imaginations and live the best versions of themselves every day. For more information, visit http://www.angiarts.com. Angi Perretti is an author, costume designer and an instrumental participant in promoting the city of Orlando to a world-class arts community. She is the founder of “Walking~Works~of~Art,” a philanthropy for the arts, and has previously published two other books: “The Chronicles of Angi Perretti” and “Swans of the World Habitats.” Perretti has three children and five grandchildren and hopes to inspire their awareness for reading and literary culture.